Recently my brother wrote to you about a fire that destroyed my Range Rover Sport, but he didn't give you the registration details or the VIN. So I will give them to you so you can maybe give a more detailed answer. Firstly Land Rover has had 14 weeks to come up with a answer but has just informed me that they can't find a reason for the fire, and it also took them 7 weeks to actually look at the car. The car was first registered 1/3/2015 and the VIN is SALWA2KEXFA520178. Surely the warranty covers this? Just because they can't find the fault doesn't disguise the fact that there was a failure somewhere in the engine compartment. They are now washing their hands of the problem and passing the buck to the insurance company. Is the warranty worth the paper its printed on? Should I just go along with this or should I take it further? 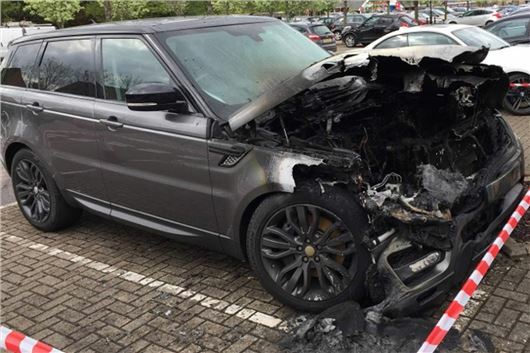 A prototype Range Rover caught fire at JLR's Mileage Accumulation Facility at Whitley in May 2017: http://www.coventrytelegraph.net/news/prototype-range-rover-fire-whitley-13041402/ It looks as if that fire was caused by the radiator fan motor overheating because that the sort of thing that is tested for in 'Mileage Accumulation'. Notice the large supplementary fan adjacent to the front of the burned out car. There was a recall in January of different models: 31-1-2017: R/2016/289: Land Rover Discovery Sport, Range Rover Evoque with 2.0 litre diesel vehicles with automatic transmission: Electrical Short Circuit: It has been identified that the engine wiring harness of the 2.0 litre engined vehicles fitted with automatic transmission may have been incorrectly routed which may allow the wiring harness to contact the water charge air cooler bracket. Engine vibration can cause a chaffing condition where the outer sheathing of the cable can wear through and expose the wires of the engine harness. Depending on the orientation of the wires within the harness, the damage to wires can result in electrical arcing and a short circuit. This condition can also result in the illumination of a warning light on the instrument panel, loss of the electronic steering system, engine cut out without warning, melting of the cable sheathing and surrounding parts. Also, in extreme circumstances it can cause an under-bonnet fire. Fix: All affected vehicles will be recalled to inspect the clearance between the engine harness and water charge air cooler bracket. If the clearance is not to the correct specification the wiring harness will be repositioned and secured to ensure the specified clearance is achieved. If the engine harness shows signs of chafing the engine harness will be repaired, re-positioned to ensure the correct specification. VINs: SALVA2BN2HH168185 to SALVA5BN3HH188706 and SALCA2AN9HH633943 to SALCA2BN2HH653045; build dates: 4-7-2016 to 10-10-2016. There was a, further official safety recall no R/2014/091 for the Range Rover and Range Rover Sport on 10-11-2014 involving 1,331 vehicles because "An internal fault can create a short circuit within the fan control module which may lead to overheating of the insulation and ultimately fire within the engine bay. This may happen with the engine switched off and possibly when the vehicle is unattended." Fix: Replace electric cooling fan assembly on affected vehicles. VINs: SALWA2PF1EA000001 to SALWA2PE9EA000061. Build dates: 09-03-2012 to 22-01-2013. There was yet another recall no R/2017/145 for the Range Rover Sport and the Discovery 2.0 litre diesel on 22-05-2017 involving 692 vehicles because "The fuel return hose may leak. Increased fuel odour may be noticed and drivers may also observe liquid fuel puddles underneath the vehicle. It is possible that fuel may leak onto the road surface, which can present a skid hazard to other road users increasing the risk of a crash. Should leaking fuel come into contact with a sufficiently hot surface in the engine bay there will be an increased risk of fire." Fix: Recall the vehicles that are likely to be affected and replace the fuel return hose. VINs: SALWA2FN5HA142204 to SALWA2FNXHA148127. Build dates: 15-02-2017 to 30-03-2017. Combined, I think that all of this is sufficient evidence for a judge to rule that the car was likely to be fundamentally faulty. Lookers has taken care of you while JLR investigated. The next step would be for the parts that were taken away to be returned to the car and for the car to be examined by the insurer's fire investigator. My advice is to make your insurer, the insurer's fire investigator and the DVSA fully aware of all of the above and you may well find that because you have done so the vehicle is directly replaced by a new one by JLR rather than by the insurer. I am looking for a reliable 7-seat, petrol, torque converter automatic, to replace my 2002 petrol Zafira auto, which has done 120,000 miles and is becoming costly in repairs. I have been happy with that vehicle and would be happy to replace it with a 2006 - 2008 Zafira, but the petrol automatics are rare and my supplier doesn't rate their reliability compared to my present Zafira and believes the are becoming expensive to repair. I have no particular objection to diesel models, but I seldom do enough long journeys to justify buying a diesel with DPF, never mind the current demonisation of diesel. Can you please recommend reliable petrol alternatives at up to £8,000. Toyota Verso 1.8i Valvematic Multidrive S. It is a CVT, but the engine and transmission work well together in this car. In the past you have admired LV= for insurance, but I read in the Daily Telegraph that LV= has now got a tie-up with the major Allianz group over LV’s commercial insurance renewal work. Do you have any views about this, LV=’s continuing motor insurance now and your current insurance preferences? No. I simply base what I write on feedback from consumers of which I get more about motoring than anyone else in the country. If feedback on LV= becomes negative, I'll say so. I have a 12 year old, 3-door Ford Fiesta 1.2 Zetec that has done about 55,000 miles. It is not in particularly good condition. I want to exchange it for a similar new car, but with 5-doors, and am considering one of the scrappage deals available, for example for a Vauxhall Corsa. I do about 6,000 miles per year, mostly urban driving. What would you advise? These scrappage deals are a bit fake really because they only give you for scrappage what you could have obtained as a discount anyway, particularly on Vauxhalls that are typically retailed at 15% - 25% discounts on list. A Viva might suit you better than a Corsa, but Vivas are cheaper anyway so are not discounted as much as Corsas. If they’ll give you £2,000 scrappage for a Viva that might be a deal worth doing. I like the look of a double cab pick-up: seating for 5 in relative comfort and a loadspace for trips to the tip. They all seem to be diesel. Does a petrol model exist? And, if not, can I get a decent diesel model for around £12k as an auto please? No petrol pick-ups and none of the autos in pick-ups are what I would describe as "decent". All slurry and horrible to drive. But the best for £12k is an Isuzu Rodeo 2.5ITEQ or 3.0ITEQ from 2008. Lovely diesel engine and an excellent 5-speed manual transmission. I bought the one in the photo. Thanks very much indeed HJ. I guess as I currently drive a Defender 90 I will notice an improved ride. The Toyota HiLux looks nice also. Is it the same as the vehicle you have suggested please? No it isn't. The Isuzu D-Max/Rodeo with I-TEQ 2.5 or 3.0 engine is recommended over and above the HiLux. The Isuzu is maintenance free chain cam. The Toyota is belt cam. I have an Austin Healey 3000 MK3, BJ8 (twin SU carbs), which starts from cold on the button - so long as I have given the fuel pump a few seconds to do its bit. My problem is that once the engine has been warmed up and the engine switched off, she is infuriatingly determined not to let me start her up again. Am I using the wrong swear words? Any advice please? Probably needs a single squirt of the throttle pedal to the floor and then back up before turning over for the warm start. If that doesn’t work and it floods, hold the pedal down to the floor (don’t pump it) to admit enough air to balance the fuel in the carbs. I have a 2016 VW Golf GTi fitted with Active Cruise Control and Area monitoring system (Front Assist), including Emergency Brake. Am I correct in thinking that at less than 19 mph it would automatically stop if I failed to operate the brake when a collision was inevitable? The instruction book is rather ambiguous on this matter. That's what it's supposed to do, but don't rely on it. Difficult to check, of course, unless you have access to a large, soft, inflatable object that would not damage the car of the City Stop did not work. I own a May 2012 Volvo XC60 four-wheel drive with 42,000 miles. It has Citysafe, winter pack, tinted rear glass, security pack, etc., etc. My local Volvo garage is getting in a May 2016 XC60 (6,200 miles) with identical specification. The only difference between the two is that my car is a D3 and the newer one is a D4. Could you please advise current values and exchange costs. The new one has Volvo's new, much better 4-cylinder engine. Here is pricing for your car: /used-prices/Volvo/XC60/2012/?q=D3 Here is pricing for the 2016: /used-prices/Volvo/XC60/2016/?q=D4/ You can use: /used-prices/ to look up pricing yourself. Forgive my ignorance, but when there are different size wheel options for a given model of car, is there an adjustment made to the odometer/speedometer or are perhaps different profiles used to keep the circumference constant? I ask the question as I am looking at buying a new car which comes as standard with 17-inch wheels. I already own a good set of 15-inch alloys fitted with winter tyres. Apparently the stud patterns match and I might need hub shims to suit, but what are the implications of fitting 15-inch wheels with 175/65R15 tyres on a car that was supplied on 17-inch wheels with 225/45R17 tyres). Is this feasible or am I perhaps asking too much? If it can be done, then I might need to fit TPMS valves anyway and could possibly change the tyres then, which might still work out a better proposition than starting from scratch or the hassle of swapping tyres on the rims twice a year. I just wish it were possible to specify something like the Michelin Cross Climate tyres when you buy a new car. Yes, you got that right. All the circumferances are approximately the same. The difference in comfort is accounted for by deeper profile tyres on smaller diameter rims. You have to check if your 15-inch wheels will fit around the front brakes. But if your new car has a valve based TPMS system that is not compatible with the older wheels then quite a lot of trouble can start. If it has ABS relucutor ring based TPMS you should be okay. My Subaru 2006 Impreza 2.0 R Sport 5dr hatchback 1,994cc is fine. I love it and get it meticulously serviced annually to manufacturer’s schedules regardless of its little mileage, which is 14,950 to date (mainly short journeys). The timing chain was replaced in September 2011. I’m told it should be replaced every five years. Is this absolutely necessary - especially since I take the greatest care of my Impreza? I would appreciate your views please. That's a timing belt, not a timing chain engine and yes, belt, tensioner, waterpump and alternator belt all need to be changed every 5 years or 60,000 miles whichever comes first. I am retired and do low mileage. My Mondeo has done 95,000 miles been serviced by Ford every 6 months since I had it at 4 years old. It has some rust bubbles at the door bottoms and has a petrol engine It will need 4 new tyres when it has its winter service on October. Should I change it for a newer model then? It won't be EU4 so faces the same ban from city centres as non EU6 diesel cars from autumn 2019. On the other hand, it's practically worthless, so any more use you get from it could be regarded as free, until it needs those new tyres. Happily, all Mk III Mondeos had chain cam engines so timing belt replacement is not something you need to worry about. I fail to understand why the Government has decided to phase out fossil fuel cars by 2040. It is a long timescale and by then who knows what the future may hold? Diesel and petrol cars have become more efficient and less polluting over the years and who is to say this will not continue? If part of the drive is to reduce carbon emissions in large urban areas then why not make buses, taxis, vans and lorries less harmful? I seem to recall reading somewhere that cars only account for 16% of harmful emissions. Also wood burners, I understand, do not help in this regard. Unless batteries are further developed, then energy retention required for such a move will not provide a satisfactory answer not to mention the infrastructure required for generation. I object to diesel car owners being loaded with penal taxes to persuade changes to take place having been encouraged to buy diesel in the first place. It will not help the car industry as I can see many car owners holding off making a change until they see the future more certain. Call me a cynic but the announcement by Mr Gove seemed to come at the same time as BMW announced they would be building electric MINIs at Cowley. My Ford Kuga Titanium TDCI is now 7 years old and has done 56k miles (8k pa). Normally I would be looking around now for a replacement but feel hesitant to do so. My wife and I have been very pleased with the car. What would you advise and what other alternatives should we be looking at? Well yes. But it has come from an EC Initiative. Write to Michael Gove who has the unenviable task of breaking this news to the nation (which he didn’t seem to mind doing at all). Thank you for your wonderful emails related to everyday car related and, other related issues motoring issues. I have 2 questions for you: How do M25 Variable speed cameras work? I have noticed the cameras are on the side of the signs. At what speed are you likely to get caught? What if you are overtaking a vehicle and need to speed up from another lane? Secondly, I have a 8-seater 1994M Toyota Estima Emina and, I am looking into a good scrappage in return to buy a another petrol car. The vehicle I have at moment is a diesel. Is this a con? I know Vauxhall is bragging on about it. The variable limits on the M25 are worked by sensor pads in the road surface that detect slowing or stationary traffic ahead so impose limits on the approaching traffic. Quite a lot of the cameras on the M25 are live and it isn't safe to exceed the limits. However, they seem to allow a greater margin when being used to slow traffic down. You only need to worry if you see one flash behind you. There is no official 'scrappage' scheme. Vauxhall is calling its scheme a 'scrappage' scheme but I doubt that the true discounts are any greater than you could get after some hard bargaining anyway. Most Vauxhalls seem to sell at discounts of between 15% and 25% anyway. What would your advice be if you spot a used vehicle that you fancy on the Internet, but it’s located at the other end of the country? Is there an organisation that will go and check it out on your behalf and come back with an informed opinion? The reason I ask is that I still quite fancy that Series IIA Land Rover in Chesterfield, in spite of the unhelpful salesman. Scotia Vehicle Inspections, the RAC Used Vehicle Inspections, DEKRA used vehicle inspections via the AA. I’d rather go and see it myself than spend a couple of hundred pounds paying someone else to check it. In your column this week you were asked about Redex. Does this apply to the use of supermarket diesel fuel in a one year old Discovery Sport? Disappointing mpg, not surprising, I assume, as they all do their mpg figures on a rolling road with everything turned off. Should I be using a more expensive branded fuel? Regarding the choice between Isuzu and Toyota pick ups. Yes the Hilux 3 litre may well have a cambelt but its the easiest cambelt i've ever seen to do so, timed at one hours labour too so even at the main dealer @ 90k intervals its a cheap job. No water pump to replace, don't even need to take the fan/auxilliary drive belt off, though it makes sense to check the condition of it after 90k miles i changed mine for belt and braces, the substantial cambelt only drives the camshaft and its own tensioner nothing else, all timing marks are easily seen. 6x10mm bolts removes the plastic cam cover, turn engine over via crank pulley bolt to align timing marks, 2 bolts sees the tensioner off, 1 bolt holds the idler wheel in place, replace idler wheel and tensioner, slip cambelt on, check timing marks are still in line (making sure the belt is not slack on its long run), remove grenade style clip holding tensioner spring back, belt is now tensioned, check once again timing marks are correct and you can always turn the engine over via the crank pulley bolt two revolutions to double check, refit cover, make cup of tea and acknowledge yet another brilliant design by Mr T's excellent engineers. Landcruiser with 3 litre is same engine, I changed my own with a Gates full kit including new tensioner @ around £80, takes the aforesaid 1 hour first time, next time i reckon 40 minutes tops. All cambelt drives should be designed like this. I'd also dispute the auto box not being good, please try one for yourself, preferably in a 3 litre Hilux HL3 or Invincible spec. I wish HJ would refrain from referring to the EU as the EC...I'm sure Londoner Govey probably doesn't even drive. Honest John is quite correct: the EU is the European Union, the EC is the European Commission which enforces regulations and directives. Only the Commission, which is unelected, can propose EU legislation. Many Brexiteers consider the EC deeply undemocratic, if not downright anti-democratic, in its nature and operation. Google 'EU democratic deficit' and see.